Which cheek, nose and outer eye muscles are involved in severe eye strain? Not just inner (behind eyeball) eye muscles have been involved in my eye strain problems which (HIGHLY PAID AND "QUALIFIED" QUACK) "specialist" doctors failed to diagnose and treat ("treating" me at great cost and unrelenting pain for completely NON-EXISTENT gland/bacterial problems), but as I noted a few weeks ago on this blog, upon further thinking about my experience, the outer face muscles near the eyes have also been involved. I experience a creaking noise from these outer muscles (now that I know what is going on), which clearly confirms that these muscles are involved. Some Chinese "traditional" practitioners (in their ignorance of human anatomy) mix up the natural tension accumulating points in muscles with what they call acupressure points. They are wrong. There is no "chi" nor any "acupressure" point. There are only what should be called trigger points. But that too, is a misnomer. The right term is chronically spasming muscles: spasming being is a defensive mechanism for muscles that have been "lifting" more than they are ordinarily capable of doing, without adequate counter-stretch/rest. As a general rule muscle tension tends to accumulate near the tendons, i.e. 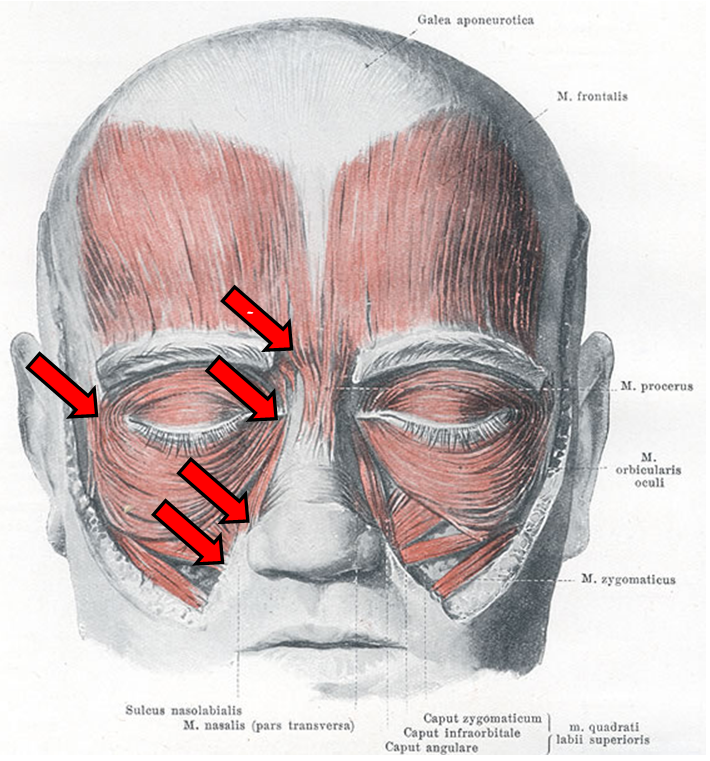 points where the muscles meet the bone. Over the past few weeks, I've been using heat therapy, Tiger balm (applying it even on my eyelids) and a lot of VERY HARD massage on key muscles where I experienced specific pain. This practice is similar in many ways to the myotherapy treatment of RSI that resolved many of my general RSI issues. There was no chart anywhere in the world that described exactly where the outer muscles are likely to become sore through excessive computer work. So I've made one (the arrows in red reflect my direct discovery and experience – and are my contribution to mankind). There is no need for computer companies to put out "warning" signs against RSI and eye strain. They should put out a clear educational pack that I'm happy to design if someone contacts me. That should mark the END to any RSI/eyestrain in mankind's future. There is simply no reason why you should ever suffer RSI/eyestrain any more. I have the COMPLETE answers. You can prevent eye strain by (a) undertaking eyeball rotation regularly [yoga] and by (b) pressing the same spots that Chinese call "acupressure" spots. This entry was posted in Uncategorized and tagged in cheeck strain, eye strain, nose strain.